���Yet another left over of all the new "toys" I got from Fry's Electronics Black Friday (Day after Thanksgiving) Sale. The 64MB portable drive is perhaps the start of a new trend of portable and stylish data drives. The 64MB version is the lower model, the highest by this company is 256MB, but other companies have gone up to 2GB. Being only about half the size of my PhD Pencil, the drive fits comfortably in a shirt or pants pocket. ���The easiest installation, ever. Plug the Cig@r Pro into your USB port and you're done. If your USB ports are located on the back of your case, you can use the USB cable provided for easier access. 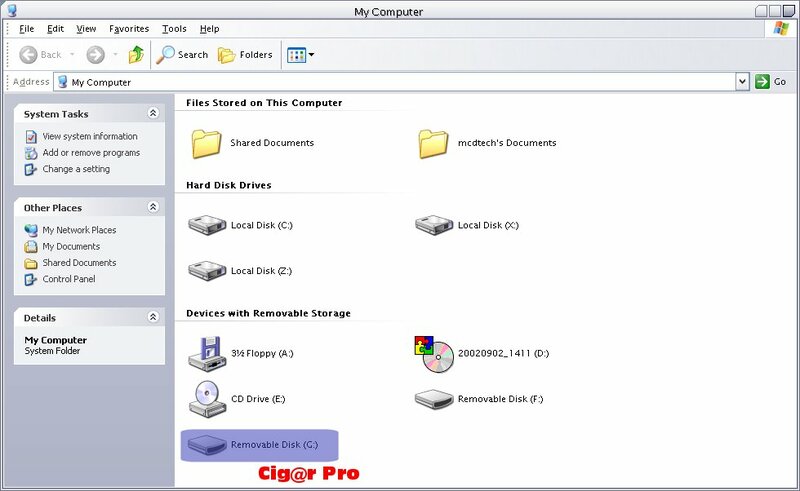 Once you've plugged in your Cig@r Pro into your USB drive go into My Computer and there should be a new drive under Devices with Removable Storage. Double-click the new drive and there's your Cig@r Pro. There should be a cigarpro.exe file in there, double-clicking it will open up your default internet browser and redirect you to cigarusb.com. Go ahead and delete that file (or leave it there, your choice) and you're finished. That's it, no drivers or software to install so even your computer inept friends and family can install and use the Cig@r Pro. I've tested the plug-and-play method on computers running Windows 98, 2000, ME and both XP Home and Professional editions. The company states that you need to install drivers for Windows 98, but I just used the method explained above and the Cig@r Pro worked flawlessly. ���Because of the small capacity of the data drive, this 64MB version is ideal for quick transfer of documents to and from work and home. The Cig@r Pro is still quite handy, being smaller than any other form of portable data (floppy discs, Zip discs and CDs) transfer and offering reading speeds of 700KB/S~800KB/S and write speeds of 400KB/S~500KB/S. The only downside to the Cig@r Pro is that it only supports USB 1.1, no USB 2.0 for now. Just for fun (because you can't do a lot of testing with this device), I took the Cig@r Pro to the AMD Xtreme Tour in early December. I was able to get a System Information screenshot of one of the display computers in less than 8 seconds, which involved taking the screenshot, pasting into MS Paint and then saving directly to the Cig@r Pro. ���You can't really do that many tests on a device like this to test its performance, so I put the Cig@r Pro through a FileSystem Benchmark with SiSoft Sandra. As you can see in the benchmark below, the Cig@r ranks higher than the Zip and Floppy discs, but compared to a 1GB JAZ disc, it performs pretty poorly. ���One of the nice things is that the Cig@r Pro is bootable, it was VERY easy to boot from the Cig@r Pro as all the files were already on the drive, plus the included CD has a very fool-proof read-me included. All I did in my BIOS was set the 1st Boot Device as USB-FDD. ���The Cig@r Pro is great for anyone who transfers documents and small files to and from multiple places and doesn't want to carry around something bulky. The easy installation and flawless performance makes this portable data drive a nice option against floppy discs and CD-ROMs. Not to mention the appearance, it sports a trendy translucent orange look, each version of the Cig@r Pro is a different color (the 128MB model is green). I would like to see a slimmer design of the Cig@r Pro as the current shape of the Cig@r Pro takes up the USB slot next to it. Another thing that would be a nice addition is USB 2.0 compatibility, not a real big problem, but the bigger these drives get, the better USB 2.0 is going to sound while doing large transfers. Overall, its appearance, reliable performance, light-weight and relatively cheap cost make this drive a nice addition to the home or office.